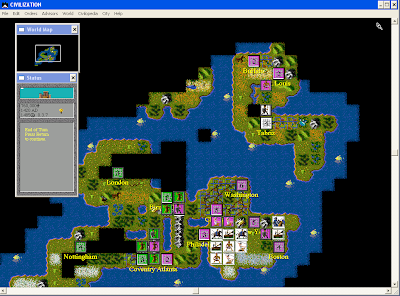 A new summer project; programming Civilization 1 from scratch. The first order of business was getting down how to get Civ1 working on my computer (Windows 3.1 version, not that DOS crap). Civilization for windows can only be run in x86 unfortunately, but there is a working Microsoft workaround. This solution shows that you can use virtual desktop to run the old 32bit Civ.exe windows client on a Win 7 64 bit system. I have had success with Civ.exe on Vista and XP so I will not discuss those. Download Windows XP Mode and Virtual XP if you don't have either already. 3. Start up Windows XP Mode, create a login and follow the setup process. 4. Find a way to transfer your CIVWIN folder to your virtual windows xp. I emailed myself the folder zipped up, then opened the internet on the virtual pc and downloaded it. 5. Start the game! CIV.exe. Need the manual for the pesky knowledge test? Find it here. Download link for civ1 files? THANKS. GOOD TO SEE I AM NOT THE ONLY CLASSIC FAN OUT THERE! your version looks much better will you please share? Many thanks for the advice here. However, when I tell it, from the XP mode, to open the Install.bat or the HDINST.bat file, it just briefly flashes a dos screen (that clearly does say "sid meyer's civilisation") at me and then does nothing. How do I get it to actually run the install procedure? I have the files from the CD all in a subdirectory within a flash drive, and it is the Install or the HDINST file within that that I am trying to run. Do I have to move them to the root of my USB flash drive, or is it more fundamental? I managed to set up a directory within the C directory as seen from the XP screen, and to transfer the contents of the CD to that. Then I used a dos prompt. at which point typing CIV and carriage return started the familiar civ startup - chose type of screen and all that. The video device failed to initialise for fullscreen mode. Choose "close" to terminate the application. then you get the choice of "close" or "ignore" buttons. Click close and it closes, click ignore a couple of times, and the dos box shrinks and freezes. 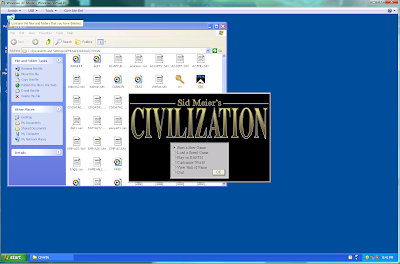 Are you using the DOS version of CIV or the windows version (as shown above?). It sounds like you have the original game CDs, one potential hack could be to install it on your current PC (if possible), and copy the installation directory to Windows XP Mode. That is the approach I took. Joe - yes I do have the original game CD - just one CD. I think it's a dos version, but it worked perfectly on an earlier windows 3.1 computer! No, I haven't installed it on the current PC. Will have to find the CD, should be possible. But I do have a copy on usb drive of what was on the CD. I put that into Windows XP, it seemed to start working fine as described above, but then as soon as I finished the 1,2,1 choices at the beginning I got the error message regarding the video device. Has anyone else got stuck at this point? this... isn't what I was looking for. VPC was my first guess - I was hoping for something less messy. but I am having trouble installing with setup.exe any else have this? i am looking for a way to play Civ1 for windows on windows 7 without the Virtual PC and XP mode. is it possible?